The compact camera we've been waiting for? There may be smaller interchangeable lens cameras, but the LX100 is a joy to use. It gives you bags of control and produces high quality images. Just beware of flare when the sun is near the edge of the frame. High-end compact cameras are very tempting if you want the power and control of a digital SLR but you also want a camera you can put in your pocket. But there's a price to be paid. A small camera usually means a small sensor, so the image quality tends to suffer. That's why the Panasonic LX100 is such big news – it gives you the best of both worlds. It's still a high-end compact camera that will fit in your jacket pocket, but it comes with a much larger Micro Four Thirds sensor. This is the type of sensor used in Panasonic and Olympus mirrorless compact system cameras. 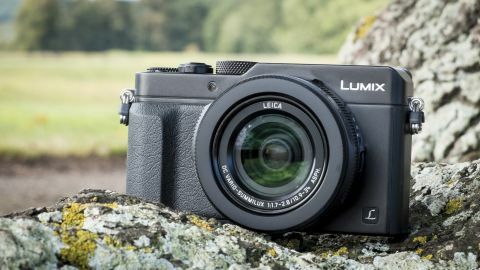 Panasonic's LX series of compact cameras, such as the Panasonic LX7 have found favour in the past because of their high quality build, extensive array of controls (for a compact camera) and impressive image quality. However, the arrival of cameras like the Fuji X100S and Sony RX100 III raised questions about the small size of the sensor inside the Panasonic LX7. Panasonic's answer is the LX100, which features a Four Thirds-type sensor instead of the 1/1.7-inch device in the LX7. That gives it an edge over the Fuji X30 announced around the same time. Further good news is that the sensor is the same 16-million pixel device as is used in the Panasonic GX7. However, as the LX100 uses Panasonic's Multi Aspect Ratio technology, images only ever use a maximum of 12.5 million pixels (in 4:3 mode). By comparison the LX7 (which continues in Panasonic's range) has a 12Mp sensor, but images have a maximum size of 10.1million pixels. The Multi Aspect Ratio system means that it's best to select the aspect ratio that you want for the image at the shooting stage rather than crop-post capture. The increase in pixel count is pleasing, but the fact that the pixels (or more correctly, the photo receptors) have increased in size by four times in comparison with the LX7 is more so, as this should mean a significant improvement in image quality. I suspect, however, that there will be some photographers who wish Panasonic had made it possible for 16Mp images to be captured. Naturally Panasonic has coupled the sensor with a new Venus engine and this enables a native range of ISO 200-25,600 with expansion settings taking this to ISO 100-25,600. The processor also makes it possible to shoot 4K video – which effectively means that you can have 8Mp stills images captured at 30 frames per second. The LX7 has a Leica DC Vario-Summilux 24-90mm (equivalent) f/1.4-2.3 lens and despite the increase in sensor size, the LX100 has a Leica DC Vario-Summilux 24-75mm (equivalent) f/1.7-2.8 optic that is only a little larger. Panasonic has managed this feat by using a new construction for the lens. The optic has six groups that can all be moved independently, and five aspherical lenses created from a 'special material' with extra dispersion properties. The company has also used multiple lens centring technology to ensure that each element is precisely aligned. In addition, Panasonic has given the aperture nine blades – it would only normally use 7 in a compact camera lens – and this should ensure better bokeh (the appearance of out of focus areas). If the company had used the same design and materials to build the LX100's lens, the change in the sensor size would have meant a ridiculously large optic on a compact camera. To meet the demands of photographers who want to share images quickly, the LX100 has Wi-Fi and NFC technology built-in. There's also a QR code display to enable quick Wi-Fi connections to be made with non-NFC devices. Although the LX100 doesn't have a built-in flash, it is supplied with a small external flash that can be slotted into the hot-shoe. As usual, there are a collection of autofocus options (Face/Eye Detection, Tracking, 49-Area, Custom Multi, 1-Area and Pinpoint) and it's possible to focus manually. As is becoming common with compact system cameras, there's a Focus Peaking display that shows the areas of highest contrast, which are also the areas of sharpest focus. In addition, there's a zebras display that indicates areas of the scene that are close to burning out. There are two zebra pattern options available, and the user can specify the level at which they activate running in 5% increments from 50% to 105%.